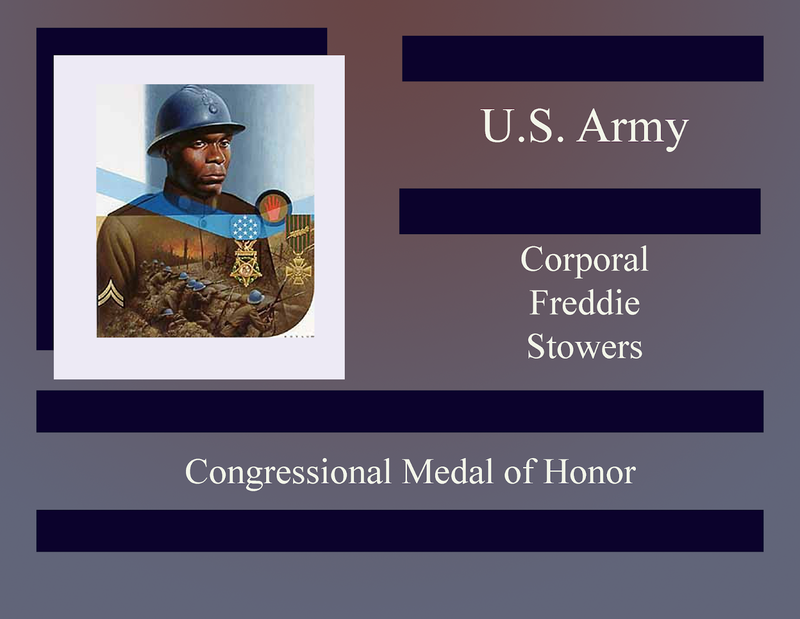 Corporal Freddie Stowers was born on January 12, 1894, in Sandy Springs, South Carolina. He spent his youth working as a farm hand before being drafted into the U.S. Army in 1917. Corporal Stowers was assigned to Company C, 1st Battalion, 371 Infantry Regiment which was assigned to the French Army's 157th "Red Hand" division. During the assault on Cote 88, his unit, while being mowed down, kept attacking. Eventually, he and his unit took the hill near Ardeuilet Mont Fauxelles. He was killed in this action, dying on September 28, 1918. He is buried in Ardeuiel-et-Montfauxelles Ardennes France.